Poway Progress, July 21, 1894, p. 4. It was a good week in the county for rain, and also for rainbows. With the sun intermittently coming out between the showers in my neighborhood, I observed four or five in one day. This, naturally, led me to think of the small valley near Fallbrook called Rainbow (yes, readers, this is how my brain works). And I remembered my surprise at discovering that this valley didn’t get its name from anyone ever seeing a rainbow over it or anything like that, but was rather named for a real live person: J. P. M. Rainbow. 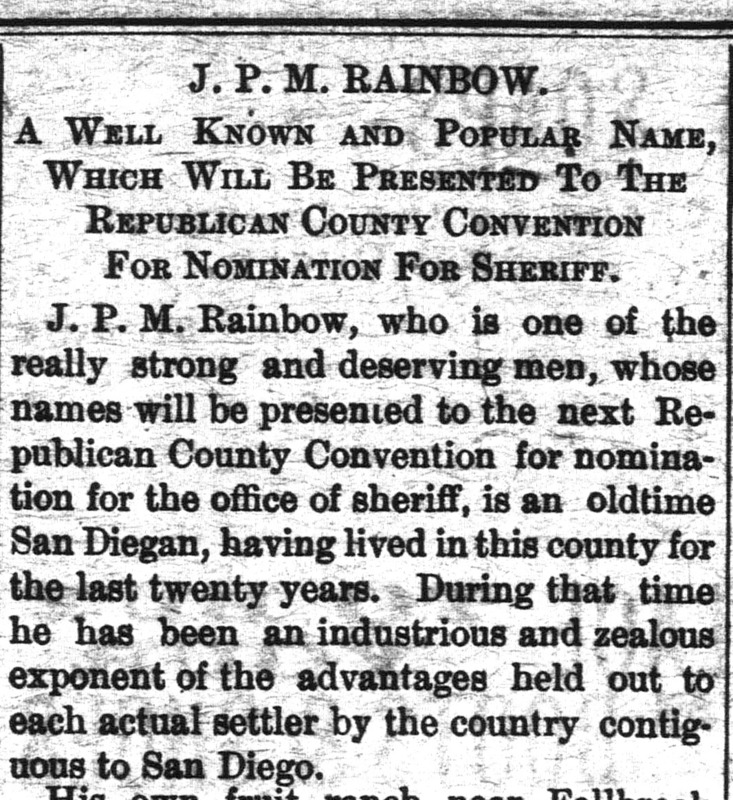 James Peebles Marshall Rainbow, usually referred to as J. P. M. Rainbow, came to San Diego County from his native Pennsylvania in 1875. He settled in the Fallbrook area with his wife Augusta and began growing fruit. He apparently did pretty well as a farmer. Rainbow also found time to serve in county government. He was elected to the county board of supervisors for two terms, from 1882 to 1884 and again from 1891 to 1895. The Rainbow post office closed in 1914, but the name remains. Sources for this post included historic San Diego and Poway newspapers, the book San Diego County Place Names by Leland Fetzer, and the database Records of Appointments of Postmasters, 1832-1971 at the National Archives. “An industrious and zealous exponent of the advantages held out to each actual settler by the country contiguous to San Diego.” Is he talking about Mexico? I think the writer was referring to the county beyond the city of San Diego. Rainbow, after all, farmed in the northern part of the county and was a big booster for the county in general.